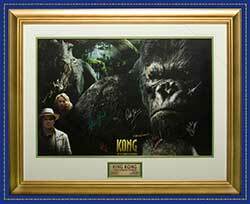 King Kong - autographed 'Movie Poster'! Lord Of The Rings - autographed 'Movie Poster'! An ancient 'Ring' through a strange twist in fate, has been given to a small Hobbit named Frodo! The 'Ring' is in fact the 'One Ring of the Dark Lord Sauron' and Frodo is joined by Gandalf, Legolas, Gimli, Aragorn, Boromir and his three Hobbit friends on his quest to destroy the 'One Ring'! 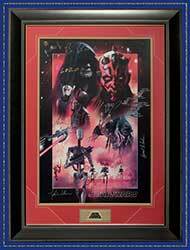 The poster is signed by the entire cast, including Annie Lennox! Star Wars - autographed 'Movie Poster'!